I thought I would start a page regarding the climate here in Palmyra. This is so I can (or you can) look back and see what it was like. 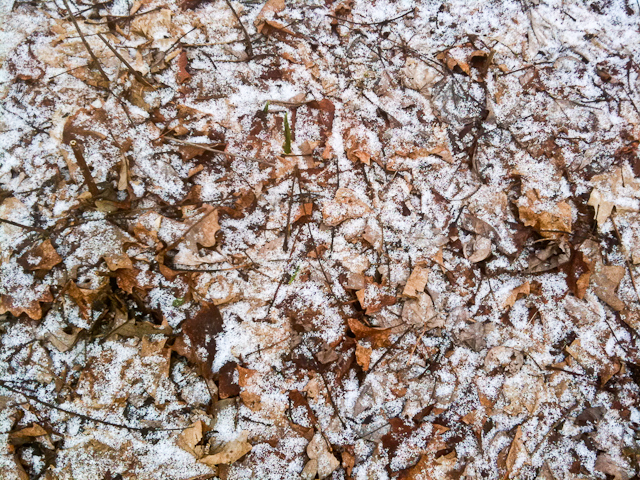 1 – December 1st – 1st snow. Enough to make the lawn look white long enough to snap a photo. 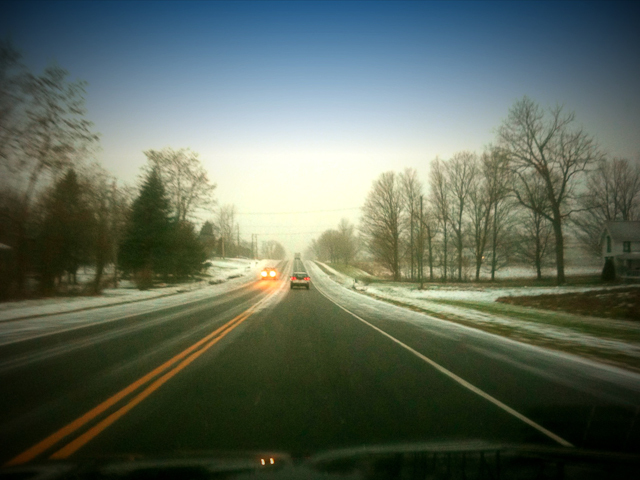 2 – December 9th – 2nd snow. 3 – December 10th – roads a little on the slick side, but not a lot of snow. 4 – December 15th – It started around 3pm. By about 6:30pm there was about 1/4″ on the ground. It has been falling really slowly. 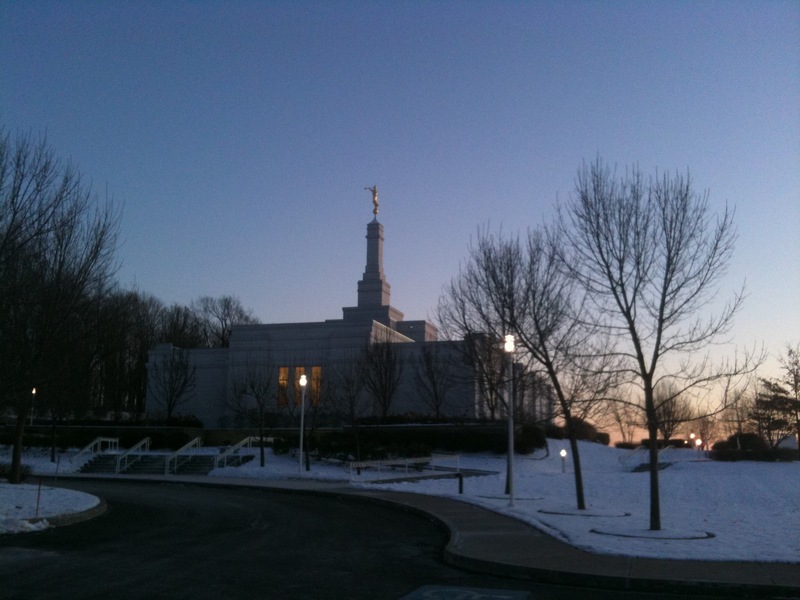 When I got out of the temple, there was about 1/4 to 1/2″ on the ground and it was 35F outside. 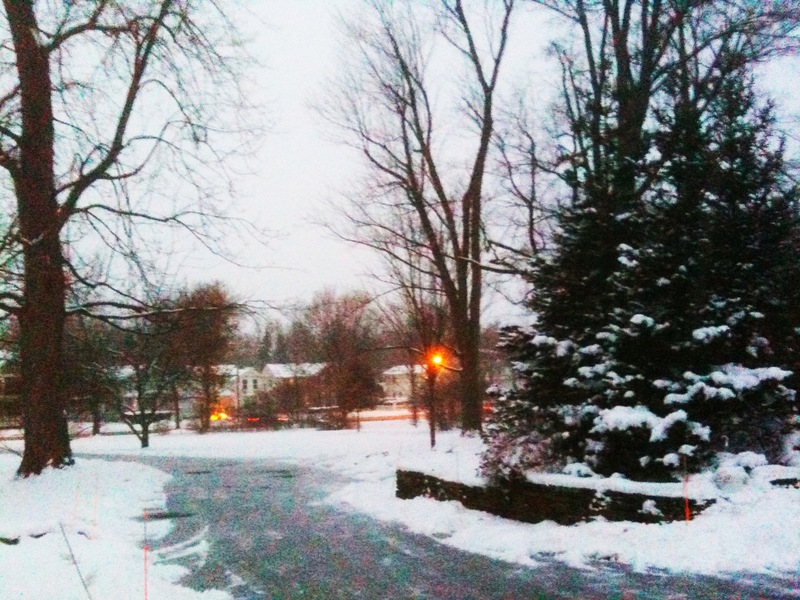 5 – December 16th – Woke to 2″ on the driveway. 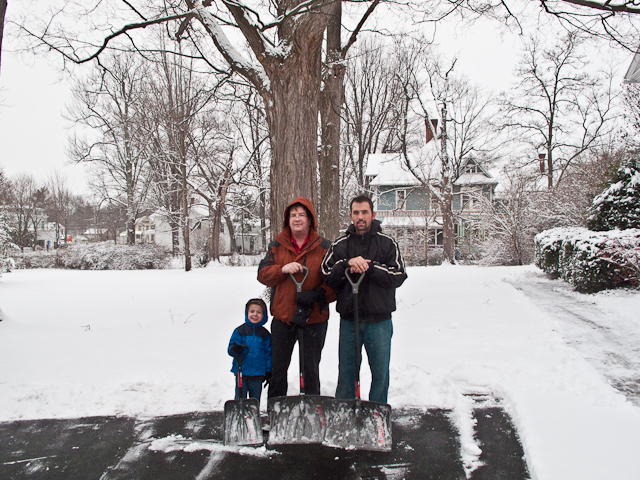 Elder Flynn and I cleared the driveways (Main Street and Hanson Street). Took the following shot when I get to AT&T in Rochester. 6 – December 17th – Woke to 2.5″ on the driveway. Although it wasn’t snowing when I got up and shoveled the drive way, by the time I was ready to drive to Rochester, it was coming down pretty hard. A hard snow fall here accumulates slowly. 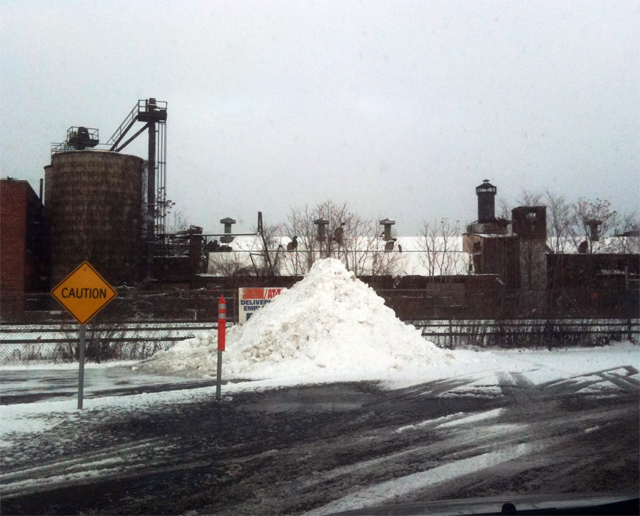 This is not Utah/Idaho/Colorado type snow where this would have resulted in 24″. This stuff melts nearly as quickly as it falls. It is VERY wet. 7 – I’ll count today only because you could see a few flakes on my drive way. About one flake per square inch. I’m not sure why I am counting December 22nd as a snow day… but we might get more later on, and this mornings snow fall, all thought not measurable, is barely noticeable. Evening update: It has started to snow and I’m on my way to the temple. It isn’t a lot, but enough that you can see where cars have driven on the streets. So, today does count as the 7th day of snow this season. 8 – December 23rd, 2009 – Today IS a SNOW day. I got up at my usual 5:50am and it appears it has been snowing most of the night. I’m giving it 3.5-4 inches. After showering and dressing, I began the shovelling. 70 minutes later, I have the drive way cleared, and it is coming down like crazy. There’s already 1/2 inch on the driveway where I shovelled. 9 – December 28, 2009, 2.5 inches but not the 5 inches they predicted. Also, the worst storm yet, but nothing to fret about. 10 – December 29, 2009, 1.4 inches today. Total accumulation is a little under 4″. It is a very dry snow today and it is about 10F outside. 11 – This will be the last snow of these year, but not this winter season. December 31st, a few snow flurries. It is not measurable at this point, but they are estimating about 1/4 of an inch before the day is over. As this year closes, I am not trusting AccuWeather any more. They are so far off. Three times in the last few days they have said one thing WHILE something else is happening. For example, right now it is snowing, but they say we aren’t supposed to get snow until 6pm. Hey… it is SNOWING NOW. And, a couple of days ago, it said “sunny” while it was snowing. And, yesterday, it never snowed, but it showed it snowing, but their radar map didn’t show any storm overhead (which corresponded with the sunshine we got. Total accumulation on my deck is about 3-4″. Currently, all the snow on the streets and sidewalks has melted, and in some spots you can see the lawn. 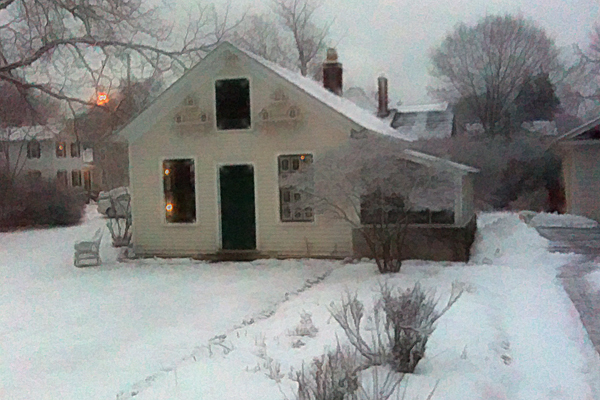 12 – January 1st, 2010 – Above freezing, but it has snowed almost all day. Irony of it all is, it is melting faster than it is snowing. So, the accumulated depth is decreasing, but the snow is still falling. I don’t ever remember seeing it snow in Idaho, Utah or Colorado when it has been this warm outside. Oh, here’s a funny one. The snow over the greenhouse was melting and pushing the icicles. 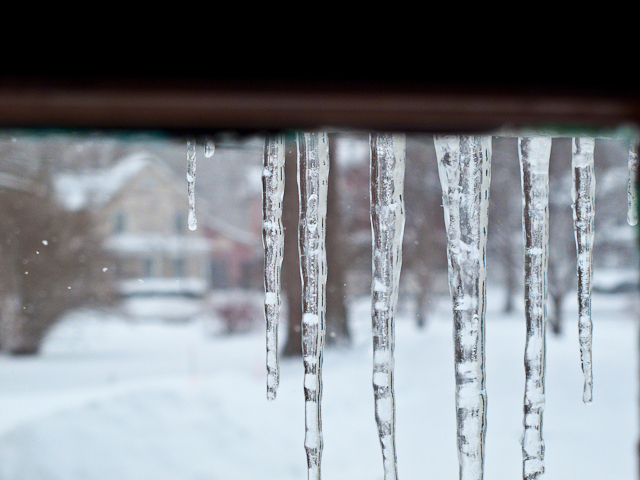 A while a go, the icicles were horizontal. Now, they are starting to rotate even more and are pointing upward. I’ll post the picture on my FB page. 13 – January 2nd, 2010 – About 2″ this morning. 14 – January 3rd, 2010 – On our 14th day with snow this season I woke around 6am to a break in a rather big storm. I got the driveway cleared and no sooner than I did, it started coming down again. Upon returning from church I found had an accumulated depth of 6-8″. (Now, that is accumulated. According to AccuWeather, we’ve had about 1.5″” this morning. I only believe that to be true because most of it has been blown by the wind to Michigan and beyond.) I did clear 2″ off the steps before church, and about 1.75″ off after church. True, the snow has been drifting, but less so on the steps than elsewhere. So, we probably had close to 4″ of snow and about 60% of that has been blown to some poor town west of here. 15 – January 4th, 2010 – No snow overnight, but about the time I left for Rochester it had started up again. 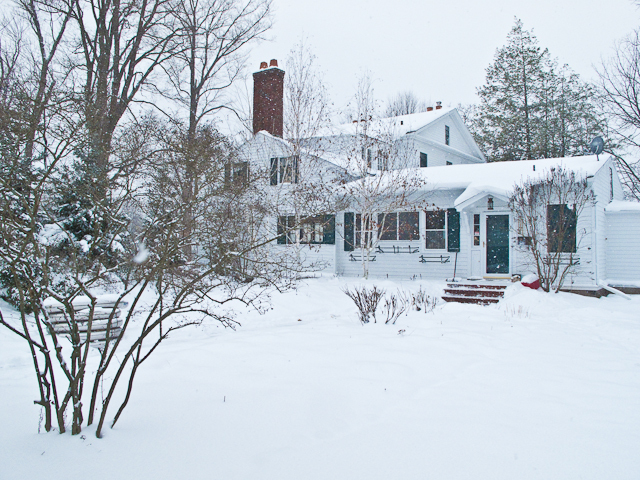 16 – January 5th, 2010 – I got up at the usual time and shoveled about 1/2″ of powder off the driveway. Hardly worth shoveling, but I need the exercise. The cold nights keep the snow from melting at night, but my guess is the sidewalks and driveway will be clear before the end of the day. It is January 7th, 2010 – No new snow since the 5th. It isn’t melting as quickly as it has been cold and overcast. 17 – January 8th, 2010 – light dusting this morning of about 1/2 an inch. It’s lunch time now, and it started snowing again. Came dinner time, it was really coming down. My guess… about 2″ of snow. 18 – January 9th, 2010 – Over night we got a total of about 2″ more. So far, this has been the thickest I’ve seen it on the driveway in the morning. I started shoveling, but had to run an errand. When I came back, I completed the job. Because it was thick, fluffy, and very dry, it was like shoveling feathers. Total accumulation right now as about 6 inches. Under neath the snow, it is wet and melting. and where I shoveled the driveway, the snow has melted and turned to slush. It’s January10th, and no snow today. The sun has come out several times today and it is in the mid-twenties, but no snow. 19 – January 11th, 2010 – It almost was a no-snow day. About 7pm tonight it started every so slighly. 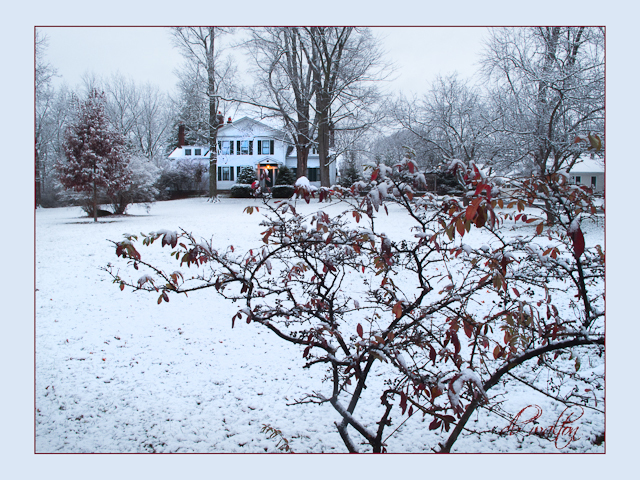 20 – January 12th, 2010 – There was a dusting of about 1/4 to 1/2 an inch this morning. It’s lunch time, and the flakes just slowly drift to the ground. It isn’t amounting to anything because more is melting than falling. The weather on the radio said it is going to warm up. Will it warm up enough to melt the snow? I don’t know. 21 – January 19th, 2010 – Well, it has been a week since it last snowed. We got about 1/4 of an inch last night. Enough that it looks like the bushes and trees were lightly flocked. It isn’t even 8am yet the snow is already starting to melt off the sidewalk and driveway. I’m quite sure I’m the only one in the neighborhood who shoveled snow this morning. Came evening, and just a little bit fell. Just enough to make the lawn look like it was hit by frost. 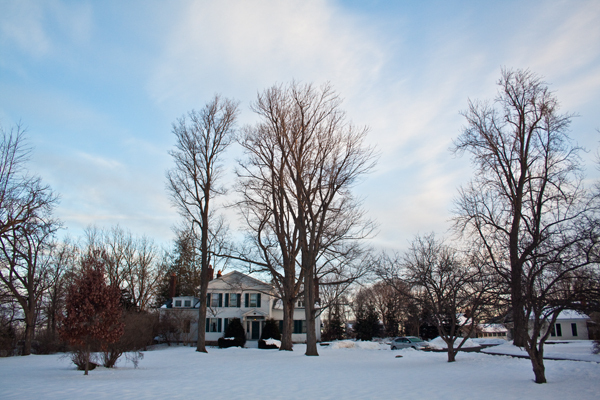 January 23rd, 2010 – no snow, but a day worthy of mention. Today was sunny and a great day to be outdoors. We had some indoor things to do, but I made an excuse to drive to Sauder’s in Senca Falls. January 24th, 2010 – no snow, but it is raining! January 25th, 2010 – 51 degrees and raining cats and dogs. 22 – January 26th, 2010 – Okay, this is getting weird having snow on Tuesdays. We’re not talking much. This was the lightest dusting I’ve seen this year. There was just enough snow that you can see a few flakes between the blades of grass. Can you really call this snow? 23 – January 27th, 2010 – Okay, today was real snow. We got about 1/2 inch when I got up this morning. It is 29F outside and a little on the windy side. By the time I got home from work, the streets and sidewalks were dry and clear of snow. 24 – January 28th, 2010 – Today was a repeat of yesterday morning. There was about 1/2 an inch of snow on the driveway again. It snowed another 1/2″ before we got home from work. 25 – January 29th, 2010 – There was about 1″ of accumulated snow when I got up this morning. I shoveled the driveway, and Diana came out and helped again. This time, it was icy as yesterday’s mid-day sunshine melted some of it, but then the temperatures really dropped last night. It was down in the low teens. Snow-shovel tip: Spray your snow shovel the night before with Preston’s ice guard stuff they make for windshields. This will keep the ice from forming on the shovel and getting clogged up with snow. Works great on plastic shovels. I don’t have a metal one so I cannot report on how well it works on them. 26 – February 1, 2010 – We got a very light dusting this morning. 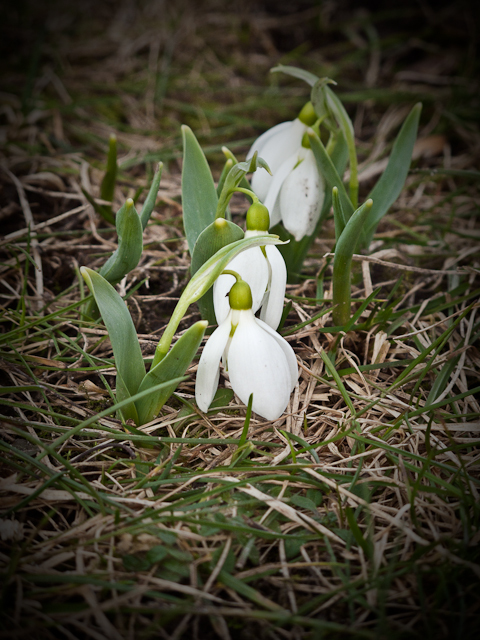 The weekend was sunny, but quite cold and we had very little snow melt from Friday’s snow. 27 – February 2, 2010 – It went nearly the whole day without snowing, but it finally snowed late in the evening. 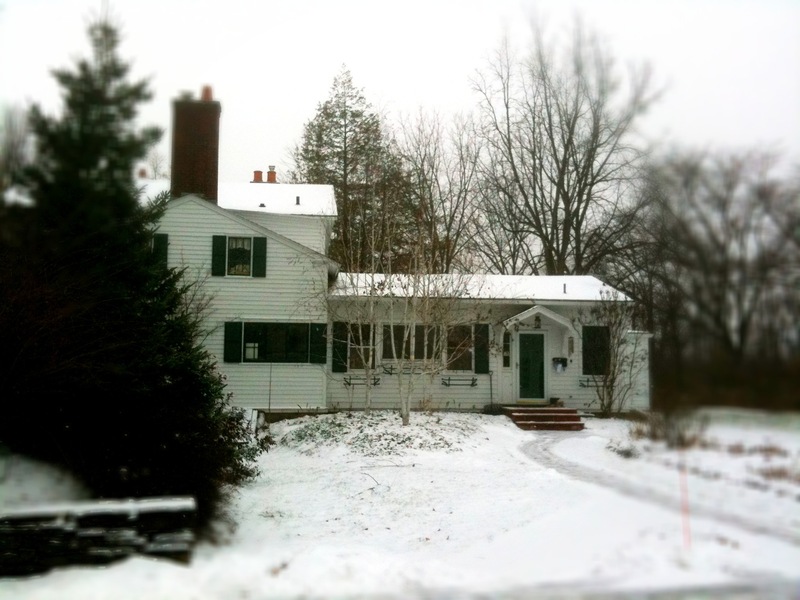 28 – February 3, 2010 – I woke to a thin blanket of snow. We’re talking about 1/4 to 1/2 an inch. 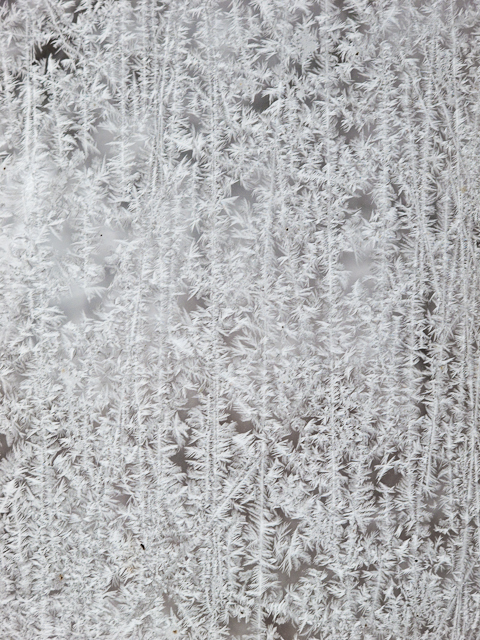 After clearing the driveway, some fluries started again. They say that it will be very light today. 29 – I was gone from 2/4/2010 to 2/12/2010, but I was told it only snowed once during the time I was gone. 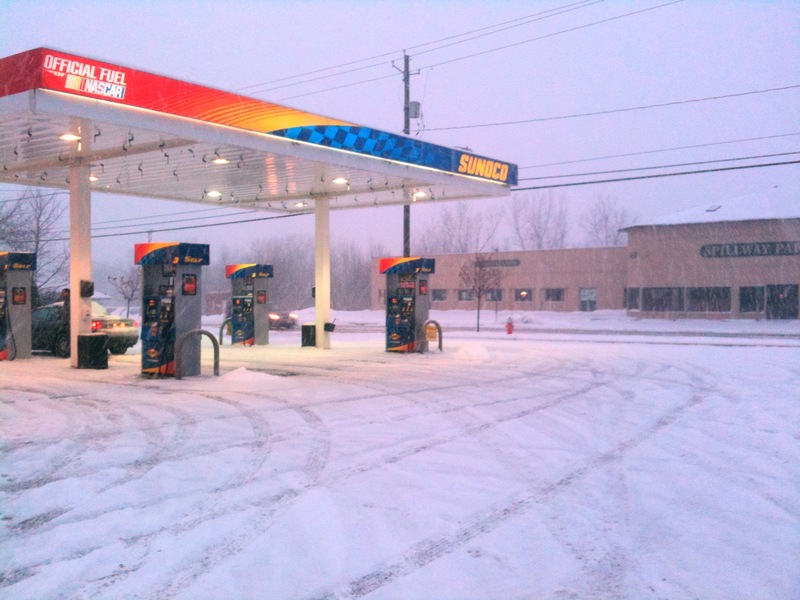 30 – February 13, 2010 – Got back to Palmyra a little after midnight and it was snowing. By the end of the day, we had got about 1/2 an inch. 31 – February 16, 2010 – We got about 1/2 an inch today. It started to melt mid day while some flurries blew through the air. 32 – February 17, 2010 – It really snowed today. We got about 2″ and it was heavy/dense and dry. This made for some bad driving conditions. Traffic on the freeways moved about 30-45 mph. 34 – February 23, 2010 – The wettest snow I have ever seen. A shovel full must have weighted 50 pounds. It was like I was shoveling concret mix. Later, it rained and melted lots of the snow. 35 – February 24, 2010 – A very light dusting today. 36 – February 25, 2010 – They were saying we would get close to record snows today. Not. It got about 1 to 1.5″ deep. But then, watching the news tonight, they said it is still coming. We’ll see in the morning. 37 – February 26, 2010 – Okay. Now that’s a lot of snow. It’s about 5″ deep where I shoveled yesterday, but it is still coming. We might get that record-breaking snow here in Palmyra. This would take me too long to shovel before having to leave for work so I called for a snow plow. The guy charges $15 to do the drive way. Given a decent snow-blower is about $900, I can get a lot of driveway shoveled for $900 at $15 a pop. Elder Flynn gets up and is trying to tell me it is 3 feet deep outside. (Little does he know I’ve been outside already.) After checking the weather reports, we received 3.8″ in Palmyra last night. So, my 5″ isn’t far off. And, it is still coming. They are estimating a total of 3-5 inches for the day. It is supposed to stop around 10am this morning, and tomorrow they are estimating a little over an inch. Pictures to follow. 38 – February 27, 2010 – We had a little bit added today. The warm air has started the snowpack melting. 39 – February 28, 2010 – The were a few flurries today, but the melt was more than the snow fall. 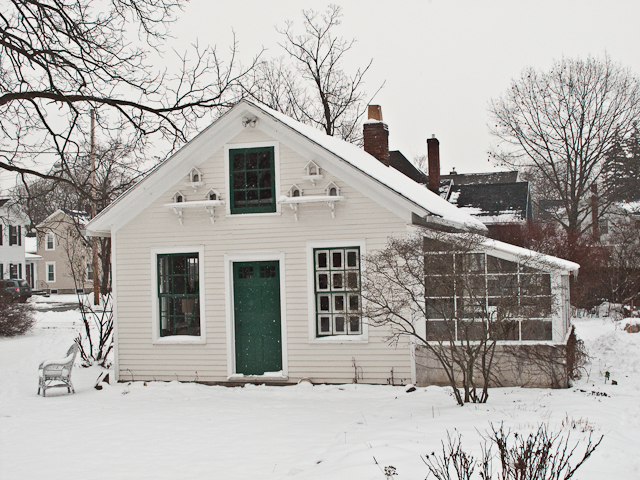 The snow over the greenhouse has slid off the roof and has created a big all of snow on the south end of the greenhouse. March 9, 2010 – It has been over a week since we have had snow. They are now talking lots of rain next week. March 16th, 2010 – Rain and sunshine is all we’ve had lately. Last week they predicted snow for this week, but now they are saying clear skies and sunny. We’ll see. We’re not out of the woods yet. It is still winter. 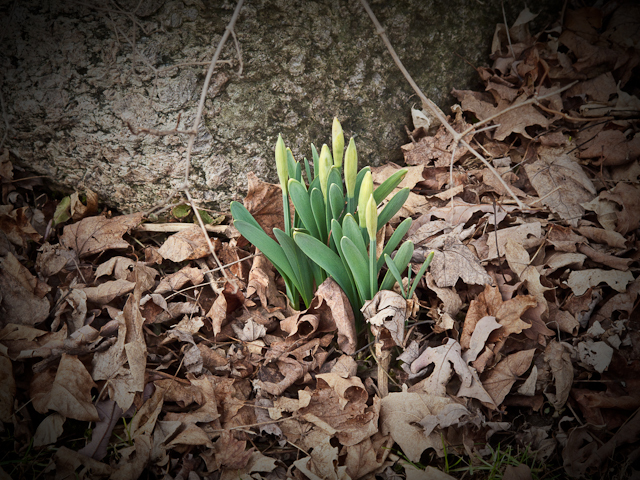 March 20th, 2010 – Spring starts today at 1:32pm. 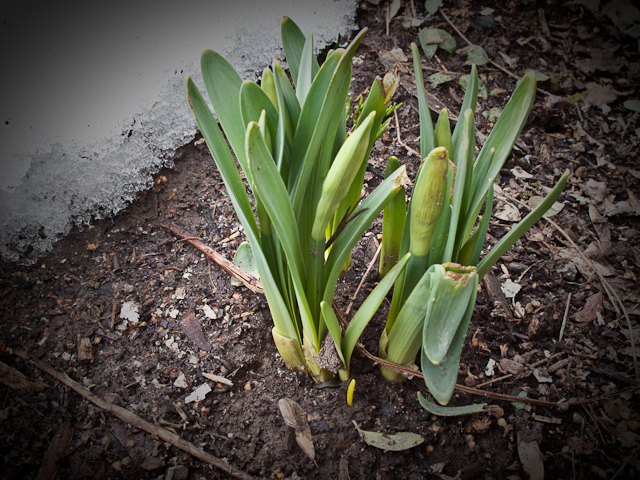 March 21st, 2010 – Today is the first full-day of spring, and it has cooled off a bit. We’re supposed to get a lot of rain in the next few days. By the way, those who are keeping track, notice Palmyra only got 39 days where it snowed. We might get a couple of early spring snows still. So, I’ll keep this up so we can have something to compare it to next year. April 1st, 2010 – No joke, but the weather to day was warm and nice. It reached 80F. April 2nd, 2010 – 89F today. Unbelieveable. It was just one week ago that it was cold and rainy. 40 – April 27th, 2010 – I’m in total disbelief. One minute it is snowing and sticking, and the next minute, the sun comes out and all the snow disappears before I can get a picture of it. This is a strange day weather-wise. 41 – May 8th, 2010 – Happy Mother’s Day, and look at the snow falling. Yes, the snow is falling, but it is far from sticking. Big, white, fluffy chunks are coming down right now (7:50am). Strange? In deed.